The graph shows the downward spiral of the virtual money in the last month that has shaved a whopping $401.99 from its value in the last month. The dramatic plunge marks a decline of 47.22 per cent. The horrifying figures will surely devastate Ethereum investors. Since reaching record-high prices of $1,338.67 at the start of December, the virtual money has failed to maintain high values and has since gone into free fall. Investors thought there could have been a brief resurgence of the cryptocurrency towards the end of January and the start of February, however prices have continued to fall. Ethereum is currently trading at $449.38 at the time of writing. 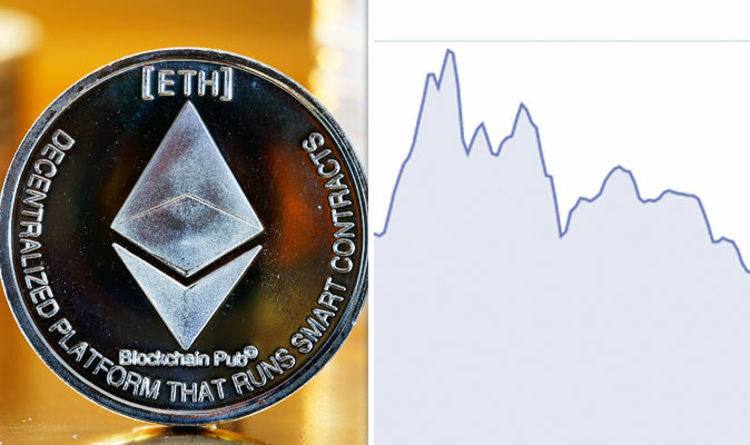 The cryptocurrency continued to fall after it was reported that a new Application-specific integrated circuit (ASIC) chip was being developed dedicated to mining Ethereum. ASIC chips have previously been used to mine crypto rival Bitcoin. Analyst Christopher Rolland is understood to have visited China where he confirmed that Bitcoin miner, Bitmain, had developed an ASIC to mine Etheruem. The analyst also revealed that “at least three other companies” are also working on ASIC’s for Ethereum. Mikhail Avady, the founder of a cryptocurrency mining website, emphasised that the redevelopment could be seen as “an attack on the network” and could severely alter the Ethereum market. He commented: “It can be seen as an attack on the network. It’s a centralization problem. “Ethereum is of the most profitable coins available for GPU mining. “It’s going to affect a lot of the market. Without understanding the hash power of these Bitmain machines we can’t tell if it will make GPUs obsolete or not. “What would be bad is if there was only one Ethereum ASIC manufacturer.